I was looking at that book last night and I saw your recommendation of Amazon. I think I'm going to get it soon. The youth at my small church are without leadership and desperate. They have little to no understanding of scripture or spiritual things. Do you think this book would be understandable to a young person? Thank you for everything you do.I appreciate it more than you know. Anyone who can boast favorable reviews by both OS Hawkins AND Brian McLaren is worth reading, if for nothing else, sheer curiosity! It is not a youth book, but with the aid of an adult, young people will greatly profit. The fact that some youth may not be able to understand it is an indictment on our culture not the author. I was a student at Criswell College when Dr. Alan Street came there to be a professor. If I remember correctly he was coming from a Methodist background and had never been immersed in baptism. With his systematic understanding of scripture it did not take much persuasion till he understood baptism by immersion and submitted himself to that truth. He was sought out due to his doctoral thesis work on evangelism which became the book "The Effective Invitation" and his comprehensive knowledge on Cults. It was not long after he came to Criswell that he became a favorite professor of most of the students. In my opinion, the fact that he did not come from a Baptist background has allowed him to approach scripture without the presuppositions that sometimes come with Baptist indoctrination. I believe he is a theologian first and a Baptist second. Unfortunately, sometimes authors write with more effort at defending their denominational position than a truly Biblical position. Thanks for the recommendation. I'm headed to the book store now to pick it up. I've read a great amount of his books, articles, papers and have no doubt will enjoy his latest work, too. I picked it up this afternoon at Mardel in Denton. I am looking forward to reading this because the subject of the kingdom of God is one of the most misunderstood concepts in the Bible. Anyhow, thanks for the recommendation. Ordered and on the way! Thanks for the review. You will enjoy it. There are some tidbits of information that are priceless. For example, the ancient practice of divination to select a future king, called augury, involved in Roman times the release of an eagle, the Roman national bird. The shoulder upon whom this warlike, vicious bird (who sometimes eats its own)rested, was inaugurated (notice the root word augur) as the new Emperor. Jesus, appointed King of Kings at His birth, was anointed by the Father at his baptism with the descent of the DOVE that rested on His shoulder. The reign of the King of Kings in His Kingdom now is a reign of peace, a reign of serving, a reign of gentleness - so that if you wish to know what "God's kingdom looks like" as opposed to a national kingdom, an institutional reign, etc..., then you look at the characteristics of the augur that inaugurated Jesus - the dove. I am waiting and hoping that it will soon be available on Kindle. I ordered the book. Sounded like a reasonable price -$10.98, but by the time it arrives in Australia Shipping & Handling adds $29.98. Today, I received 3 of these books…2 for our church library and 1 for me. I hate to admit it, but it’s the first book I’ve bought in many years. Makes me believe there are no “Drs.” in Heaven or any with extra long hems on their clothes. I like Streett’s language such as “country mile”. Now days, the speed is 60, but as a kid a big clap of thunder would empty the church with members trying to get home before the roads got muddy. On amaxon.com the shipping is free for an order over $25. My 3 books cost $10.98 each. Therefore, the total cost for 3 books with tax cost $35.16. I’m going to order 3 more for my 3 kids. I went back and picked it up and am ready to read! Thanks, Wade, for the recommendation! I just checked Amazon. The Kindle edition of the book is now available for $9.99. I just bought this on Kindle. Amazing that I am able to do this half way around the world in India in 1 minute. And I have the book on my Kindle. I am sorry about the shipping charges for Aussie John in Australia. I sometimes wonder why the Kingdom of Heaven does not appear to feature in any major creeds, confessions or Christian doctrinal statements. It is often noticeable by its absence. Perhaps it is because the writers conveniently, but erroneously, see the organised and institutional Church as being the visible expression of the Kingdom of God on earth. Did the leadership, having a vested interest in perpetuating this illusion, wish to maintain a status quo lest the hope of their gains should be lost? The Kingdom of Heaven requires personal faith and trust in the King, Jesus Christ, and the free rule of the Holy Spirit in the heart of each believer. But this unregulated situation could have been seen as a threat to the desire for having clerical positions,and exercising power and authority in the lives of the people. The Kingdom of Heaven grants its citizens the grace of freedom of individual conscience in following Jesus, in personal practise and accountability. But this is considered dangerously incompatible by those who have an agenda of strict social, cultural and political uniformity and control in both religious and civil areas of life. The institutional Church and the civil authorities worked in a cosy Constantinian model partnership in earlier days to support each other's domain, and woe betide anyone who was perceived to be undermining the foundations. William Tyndale's translation of the Bible into English was a case in point. He omitted and corrected loaded words that had been used to support traditional Catholic Church teaching, such as 'The Church', priests, penance, sacraments and others. Like Luther in Germany, Tyndale paid heavily for bringing the biblical light of salvation to the people of England. To my mind, we should be talking far more about the Kingdom of God than using the misleading term 'Church' that was wrongly established in our theological vocabulary by the AV/KJV. 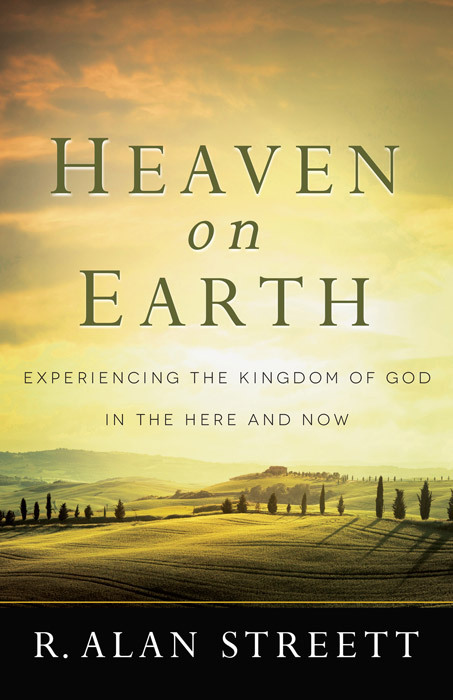 The emphasis on the Kingdom of Heaven is to be greatly welcome, both the 'Yes Now' aspect, and the 'But Not Yet' ! 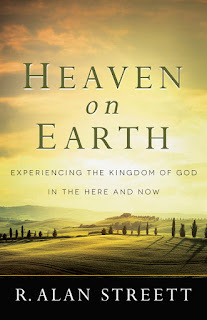 I want to thank everyone who ordered HEAVEN ON EARTH in paperback or as a Kindle edition. This is a real encouragement. You are the salt of the earth. I now pray the book will be a real blessing to you and your church. My heart's desire is to see churches everywhere transformed by the message.